Back to Cornell for this entry in Top 200 Photos. This photo is from of the earliest batch of photos I uploaded to flickr. I had just discovered Photoshop and was using what I learned from a book to create paintings from my photos. After spending a good semester doing stuff like this, I realized I preferred straight photos much better than these bits of art. It doesn’t mean I’ll never do it again, but I prefer for my photos to be photos. 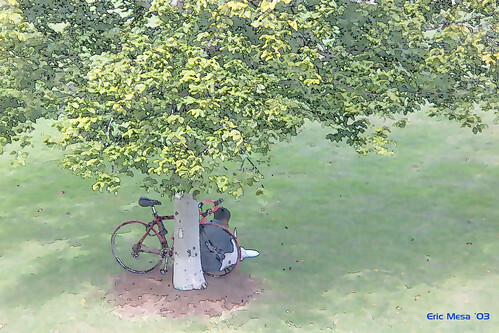 I was standing on the outside of Koch Library and took this photo of someone studying in the Arts Quad. I had one senior year!